Tuesday is a wonderful excuse to enjoy music, don't you think? Today, we would like to call out an iconic musician who first performed in front of an audience at the age of four in her hometown of Newark, New Jersey: Concetta Rosa Maria Franconero. She started out singing and playing accordion on local talent shows, until she got a spot on the popular Arthur Godfrey's Talent Scouts in 1955 (she was 18 by then). Godfrey recommended she drop the accordion and change her name. She agreed to both and became Connie Francis. Francis could speak multiple languages (including Hebrew), and had a gift for parroting other performers. She sang the songs for Tuesday Weld in the 1956 film Rock, Rock, Rock and then recorded her first number one hit, "Who's Sorry Now?" the next year. By 1961, Francis was an international star. 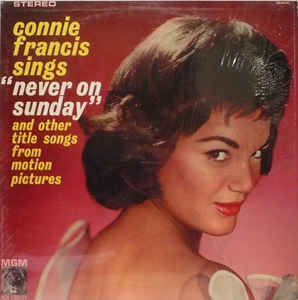 That's the year she recorded Connie Francis Sings "Never On Sunday," an album proudly displayed here at the American Treasure Tour. It is an anthology of twelve tracks originally written to complement films, recorded on August 10th and 11th of 1961. Although the album did not inspire any real hits, it was positively regarded, and one of six albums she recorded that year. Very prolific in film and music, Francis is still out there honing her craft at the age of eighty!